Softener Mate maintains the performance of all water softeners. 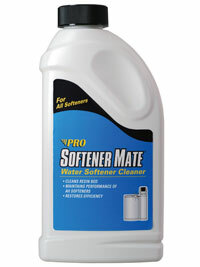 Softener Mate cleaner provides a unique blend of chemicals formulated to remove limited iron, silt, manganese, organic compounds and metal particles that cause water softener inefficiencies. Using Softener Mate regularly as a maintenance program will restore the water softener back to peak performance and help maintain the life of the unit. 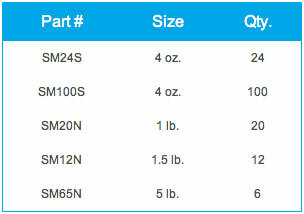 Available in 4 oz, 1 lb, 1.5 lb, & 5 lb sizes. First Application: Dissolve 1 cup of Softener Mate water softener cleaner in 1qt. of warm water. Pour the solution directly into the brine well. If the softener unit does not have a brine well, pour the solution directly into the salt tank when the salt level is low. Manually regenerate the softener. Repeat if necessary. Preventative Maintenance: Add 1/4 cup (4 oz.) of Softener Mate for every 40 lbs. of salt added to the salt tank. Layer to ensure a continuous dose of Softener Mate with each manual regeneration.